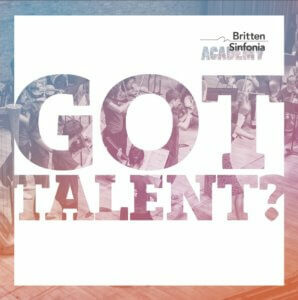 We are currently recruiting for young musicians who play specific instruments to apply to become members of Britten Sinfonia Academy for the 2017-18 season. *In order to fully complete your application your instrumental teacher must submit a short paragraph for you before the deadline on 25 August 2017. If using the PDF formats please email completed forms to [email protected] or submit by post to 13 Sturton Street, Cambridge, CB1 2SN. If your application is successful you will be invited to audition in Cambridge on Sunday 10th September, between 2-5pm. More information regarding the audition process will be given once applications have been received. Any queries contact [email protected] or call on 01223 558504. Previous applicants to BSA 2017-18 need not reapply.